Especially designed for the healthcare, leisure and education markets as well as for home use. Goelst provides a permanent unobtrusive method of hanging art work, pictures and wall decorations without damaging wall surfaces when using picture hooks. Secured to the wall as a feature itself or discretely ceiling mounted – pictures can easily be positioned and moved without damaging the walls. After installing the picture rails, the monofilament or steel supporting wires are hooked into the rail at the desired point. This allows sideways movement of paintings and wall decorations. Attaching a hook, such as a ‘zipper’ or smart spring to the monofilament or the steel supporting wire provides movement to the desired height by sliding up or down the cord. STAS minirail If you're looking for elegant, barely noticeable picture rail, then choose the minirail system. STAS cliprail If you're looking for a no-nonsense hanging system, choose the STAS cliprail system. STAS cliprail max The STAS cliprail max has an extra flange that ensures extra-tight attachment to the ceiling. With this hanging system there's no gap between the ceiling and wall. 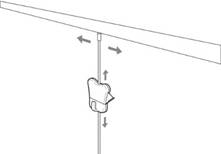 STAS u-rail is specially designed to turn a dropped ceiling system into a flexible hanging system in the wink of an eye. The rail is mounted almost invisibly on to the wooden ceiling molding. The monofilament cord is unobtrusive and used in combination with a smart spring, can carry a load of up to 4 kg and up to 15 kg per cord with a ‘zipper’. 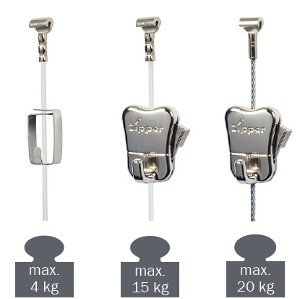 The steel cable is suitable for hanging wall decorations with the zipper - up to 20 kg per cable. Both in the health care sector and in the business community, but also increasingly at home, wall decorations get exchanged regularly. This usually results in a pockmarked wall. With our picture hanging systems, exchanging a frame is as easy as pie. And your walls remain intact. Think of the savings!